The Nun Pelagia was converted to Christianity by Saint Nonnos, Bishop of Edessa. Before her acceptance of saving Baptism, Pelagia was head of a dance troupe in Palestinian Antioch, living life in frivolity and profligacy. But one time Pelagia, elegantly dressed, was making her way past a church, at the doors of which Saint Nonnos was preaching a sermon. Believers turned their faces away from the sinner, but the bishop long glanced after her. 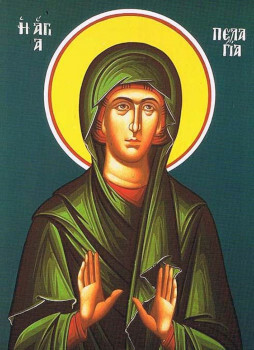 Struck by the outer beauty of Pelagia and having foreseen the spiritual greatness in her, the saint in his cell prayed long to the Lord for the sinner, grieving that the poverty attiring his soul could not compare with the splendid garb and beauty of the profligate. After this Saint Pelagia in hair-shirt journeyed to Jerusalem to the Mount of Olives. There, until her end (457), she asceticised in seclusion under the masculine name Pelagios, and attained to great spiritual gifts.